DASH LIGHTS FOR NEUTRAL AND REVERSE. 18 X 9 X 5.8 IN TIRES ON 8 IN RIMS. INCLUDES FLAGS FREE SPARE TIRE, FUNCTIONING JERRY GAS CAN, AND FOLDING WINDSHIELD. 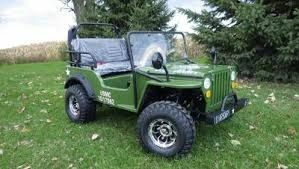 The Brand Upgraded Series 2 Deluxe Willy's Jeep Offroad Vehicle comes with a 4-Stroke air cooled engine. This unique machine develops plenty of low down torque allowing for drift, wheel spins and top speeds up to 37+ mph. Product Dimensions : 78" x 35.4" x 29.2"
1. Based on the vehicles' nature and intended use, it is strongly recommended that assembly and PDI be performed by trained professional. OFF ROAD: ATV'S, UTV'S, BUGGIES, GO CARTS AND DIRT BIKES offer 3 MONTHS PARTS, 6-Month ENGINE WARRANTY, MOTOBUYS.com will supply new or rebuilt replacement parts in exchange for defective parts for a period of 3(three) months, as well defective engines for a period of 6(six) months from the date of purchase at no charge. HANDLING OF WARRANTY CLAIMS: FOR PARTS: All Parts warranty issues must be processed through MOTOBUYS.com or if directed by the manufacturer. You must produce a copy of your original invoice showing the model number, vehicle identification number and date of purchase on the invoice, as well as a copy of your Consumer Motor Vehicle Delivery Preparation and Inspection Form to warranty your product directly. 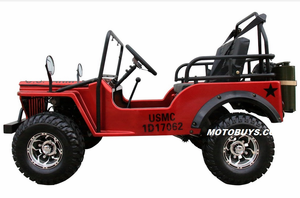 All defective parts must be returned to MOTOBUYS.com or the manufacturer as directed for inspection and verification of defect. MOTOBUYS.com reserves the right to decline any warranty claim based on the criteria listed in the COVERAGE AND LIMITATIONS portion of this warranty. INITIAL PREPERATION AND DELIVERY ISSUES Items not covered by the warranty above may be covered under the initial set up of the vehicle if reported to MOTOBUYS.com by the professional who is assembling your vehicle as soon as the unit is uncrated. Please remember to inspect each unit, and to list any shipping damages you see to the outside of the box on the bill of lading, as well as take photos of the damage. Truck drivers can be pushy, but to insure proper reimbursement and a prompt resolution, all damages must be reported to MOTOBUYS.com, as well as the shipping company upon delivery. In most cases the driver has the ability to contact their office and request a claim number for you on the spot. 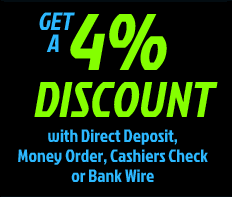 Contact your MOTOBUYS.com sales rep for details. THIS AGREEMENT AND LIMITED WARRANTY IS VOID IF ANY OF THE FOLLOWING IS TRUE: THE CUSTOMER DOES NOT USE A PROFESSIONAL MECHANIC (ENGINE REPAIR SHOP, MOTORCYCLE SHOP, OR AUTO REPAIR SHOP) OR AN AUTHORIZED MANUFACTURER DEALER TO ASSEMBLE AND PREP THE PRODUCT PRIOR TO OPERATION.